It has been a hectic week at the shop, we had a flash sale when we realised we have so much fabric that has been around a while and quite a lot of new lines coming in we needed to make some room for the new. When the fabric reps come around it so easy to get carried away with all the gorgeous new lines for the following year. That's right, we order 6 months, sometimes 12 months in advance when it comes to Christmas fabrics. Making choices from hundreds of designers is not an easy thing to do, luckily Ann and I are very similar in taste so we tend to choose the same things. Sometimes we wonder how some designs even make it on to the fabric, but most of the time saying no! is just the hardest thing to do. A shop full of batiks would be my absolute heaven, I don't know what it is but the designs and colours are just moorish, if you have a chance to see batik fabric being made it's well worth a look, the stages and processes that the skilled men and women put into these glorious materials it's no wonder they can be so expensive, they truly are works of art in their own right. here is a link to a you tube video showing the processes of making batik fabric. Just copy and paste the link into your search bar. Any way back to our seventeenth week and our progression with woven backgrounds. My piece has moved on slightly, having decided to finish it with hand stitching highlighting the boxes and rectangles stitched in with satin stitch on the machine. As I was stitching the running stitch in a perle 5 variegated thread from Stef Francis threads I was reminded how sometimes when life has thrown some of it's down times at me I tend to put those thoughts and feelings into an imaginary box and store them away in the back of mind, I find this helps my coping mechanism when life gets me down and I want to move on from those experiences and forget about them for a while. Of course they are always with you and part of your life and part of what shapes you as a person, but to dwell on those times is not a good thing so packing them up and posting them away to the back of your mind helps me to move on and look forward. I found as I was stitching this piece how calm I felt, only thinking of the needle and thread passing through the layers in an orderly way making sure the length was the same and the distance from guiding edge were parallel, all this kept my mind focused on the job in hand far from other worries of home and work just happily sewing for the shear enjoyment of making those stitches as perfect as I could. The boxes seem to be connecting together, some small, some bigger, some joined together and all the while the lovely bright colours help to put a smile on my face, because not only bad thoughts can be kept, but good ones too lovely memories of holidays and Christmas' of family and my children and now grandchildren. My daughter is 21 on Friday, she was the prettiest baby (well she would be) and from the day she was born she has been such a loving child, generous and kind hearted, a real joy! on this piece of work the memories of her growing up will occupy a very big box indeed. There are sections where I have stitched bands of needle weaving, below you can see where I have bordered a set of boxes with lazy daisy stitch and then an overall view below of the running stitches. I am enjoying this piece and hope to cover it in a mass of stitches, I will post more pictures as I go along. Below Rosie has woven lots of sari waste ribbons, sumptuous hues in all colours of the rainbow. In this weeks class we were supposed to be printing on top of the woven fabrics but in this case there wasn't a colour that would have shown up enough to make an impression, Rosie decided she would print her indian wood block print onto another fabric, embellish and stitch it and then applique onto the background. I am looking forward to seeing this finished. The block is amazing! Kay is not in love with this piece at the moment, but that happens and often can end up as the best thing you have ever done, we'll see next week when we try some stenciling on it. Trying new things can take us out of our comfort zones, Kay admits these are not her colours but she wanted to push the boundries a bit, good for you I say being brave can be very rewarding! I think this will be a wonderful tribute when it's completed. reds against the blue have a Mediterranean feel about them. look closely you will see a beautiful leaf shape. It looks quite shadowy in the background! areas with the same colour blue onto the deep red fabric. gardener letting it speak to you as it grows. Me too !!!! so much is her memories of her Grandma teaching her to sew. I think this is wonderful because boy! did those ladies know how to sew. They were taught from a young age,through necessity none of your throw away society in that era! Ann's grandma would have been amazed at what the new machine's are capable of these days and Ann has shown this by the stitching of the cotton reels and scissors which she has chosen from her sewing machines bank of decorative stitches, a real juxtaposition of the old in her recycled vintage fabrics and the new in the use of her Janome computerised sewing machine. Kinda blows your mind in a way! Mel too, has gone down the vintage route, with the use of these vintage fabrics and beautiful vintage lace. She finds them in charity shops and boot sales. Mel had a clear thought as to what she wanted to print onto the woven layers and we were all on tender hooks preprint but it turned out better than we could all imagine. Poor Mel we were all watching as she printed her beautiful home made stamp. This is the first stamp. And then the second, Fabulous !!! Can't wait to see what else comes. 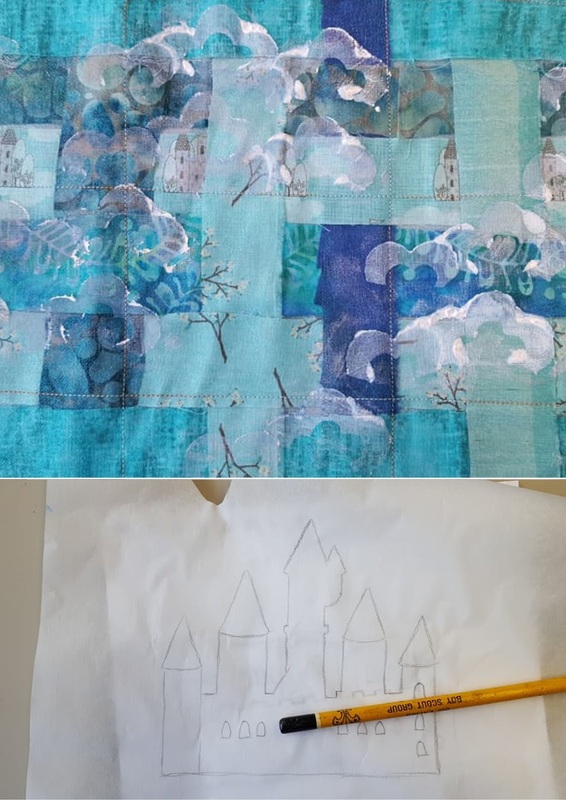 Sonia's first piece is all about the fabric, there are tiny little castles on one of the woven strips, she has drawn out a picture of the castle which she intends to applique onto the background. She has also made her own cloud stamp and printed onto the piece. I am in awe of everyone's abilities and energy, every week I give them something new and they surprise me every time with what they have achieved in just a couple of weeks. Again I am so looking forward to the finished articles. Another piece from Sonia bet you can't guess what this is going to be? 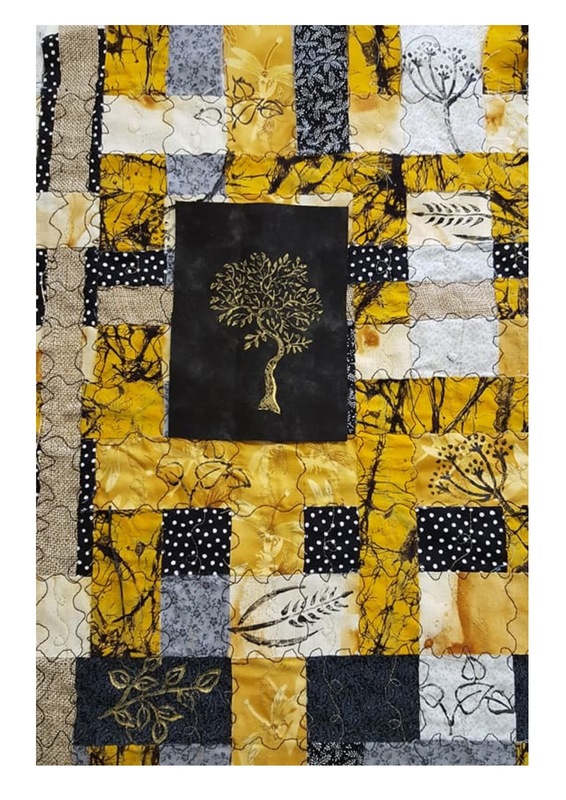 Last but not least Celia has worked this very striking colour palette, using her own rust dyed fabrics mixed with purchased printed black fabrics. Each piece of fabric has a meaning. I must apologise that I can't quite remember them all so I will tell you more about it when it's completed rather than get it wrong. She has used indian block prints to print on the background and also tree onto the black fabric as a focal point, again this is growing allowing the work to guide the next process. Seeing everyone's work each week is so exciting it's like having a birthday every week, I'm in awe well done everyone you have certainly stepped up to the challenge. Well it's nearly 11.30 pm and I am just about pooped, but I can go off to bed with a smile on my face, my daughter will be 21 tomorrow and I just can't believe where the time has gone. My big boy will soon be leaving the nest too and my little lad, is off on his first adventure away from home with a school trip to Talybont on Usk. Our lives I feel are just like the weaving in and out of the fabrics above and as we experience more we add more to that fabric another mark, another stitch, making us who we are. Make some time to sew, have a go at weaving and make your memory in print and stitch, use things that have significance a button from a favourite shirt, a photo, piece of jewellery and if you do let me know I would love to see it. You can contact me through face book at busybeespatchwork or email me beccy@busybeespatchwork.com.